Full 18 years ago, Webdunia had done what no one had even thought of back then. On September 23, 1999, when Webdunia was launched, it was “The first web Hindi portal in the wide world,” a feet without a precedence. From its humble beginning, Webdunia has now grown into an enormous institution, boasting of many branches and services and a massive base of dedicated users and subscribers. Even though the internet had arrived in India in late 80s, its official beginning is marked only on August 15, 1995, when BSNL launched a gateway service. In those days, websites were very few and far between and invariably all of them were in English. However, it didn’t take long for Hindi to break the shackles and stormed its way into the web world of virtual infinity. Over the period of time, Webdunia has only spread its wings into the web world. 18 years later, today it’s a formidable presence across vernacular languages of India. For many Indians, Webdunia is their default web portal. And for many Non-residential Indians, it is their first choice Indian portal. When we look back to the journey of Webdunia, we clearly see that It wasn’t easy to bring the traditional readers of Hindi on Web, at the back end of the century. Internet was still an enigma for most Indians. It was the brilliant foresight into the far future of Mr. Vinay Chhajlani, CEO of Webdunia, that a Hindi portal could become a reality and Webdunia has only spread its roots since then, now operating in 8 languages, with portals running in Marathi, Gujarati, English and four Dravidian languages from South India. Webdunia has many firsts to its credit in its illustrious journey. Video news on web, Web editorial (Web Varta), film review etc. all are brainchild of Webdunia. And now our mobile app is all set to involve our readers too as "Web Reporter", through which they can share their ideas, pics, videos with us, to make it a two-way engagement between the portal and its users! With millions of users, Webdunia is ubiquitous on internet, on Facebook, Twitter, Instagram, Share Chat, and its Youtube page alone has more than one lakh subscribers, boasting more than 5000 videos! 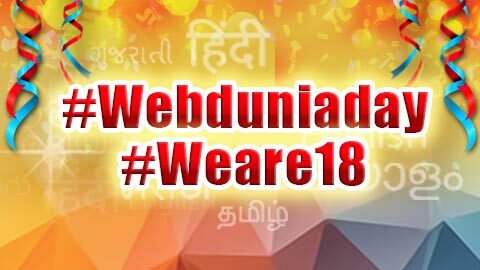 As Webdunia turns 18, we only feel humble and blessed by your dignified presence and we promise to keep the great work going for many more years to follow.